Pier is the most artificial space inside a city. Heavy, industrial, concrete area which does not respect the city tissue. 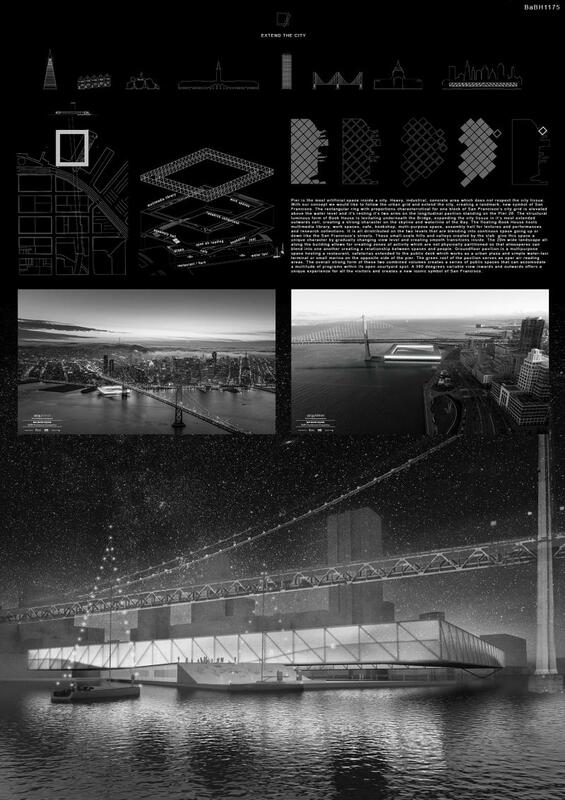 With our concept we would like to follow the urban grid and extend the city, creating a landmark, new symbol of San Francisco. The rectangular ring with proportions characterictical for one block of San Francisco’s city grid is elevated above the water. The lightform is expanding the city creating a strong character on the skyline and waterline of the Bay. Functions are distributed on the two levels that are blending into continuous space going up or down like the San Francisco’s streets. These small-scale hills and valleys created by the slab give this space a unique character by gradually changing view level and creating smooth transitions inside. Ground floor pavilion is a multipurpose space hosting different commercial services. The green roof of the pavilion serves as oper air reading areas. A 360 deegree variable view inwards and outwards offers a unique experience for all the visitors and creates a new iconic symbol of San Francisco.